A selection of scanned slides and prints from my picture taking safaris in the 1980s before I learnt to drive. Throughout the decade I worked and lived in East London, hence the preponderance of shots along the GEML and surrounding areas. Other subjects include the Southern, especially the South Western lines to Bournemouth & Exeter and the Jaffa Cake 4CEPs, the 25kV electric classes on the LM (and GE) and the Berks and Hants around Bedwyn. I also spent a week in Dumfries with my parents which yielded a day in and around Glasgow. 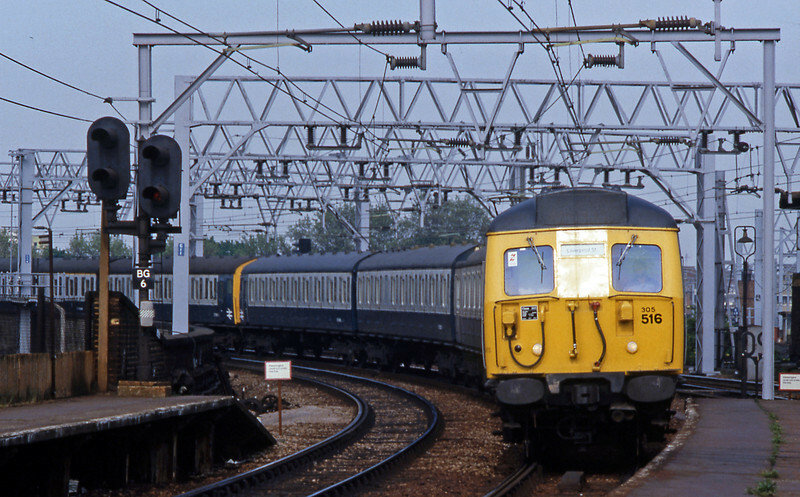 In July 1983 a pair of Eastern Region 25kV EMUs, a 305 and a 302, still in original condition with the Gresley double bolster bogies, come off the Hackney Downs Line on a train bound for Liverpool Street. The rotating vane searchlight signals are also long gone.